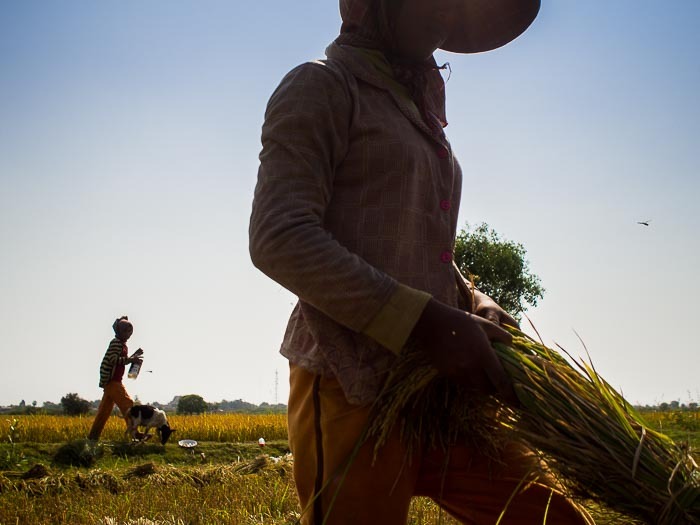 A woman harvests rice by hand in Ponhea Leu community, Kandal province north of Phnom Penh. I used a couple of days to get into the countryside during my quick trip to Cambodia. I happened upon farmers harvesting tomatoes and rice. Harvesting tomatoes northwest of Phnom Penh. I've photographed a lot of agricultural work in Thailand and it's not that different from agricultural work in the U.S. It's very mechanized, at least in central Thailand. Most of the heavy work is done by machine. 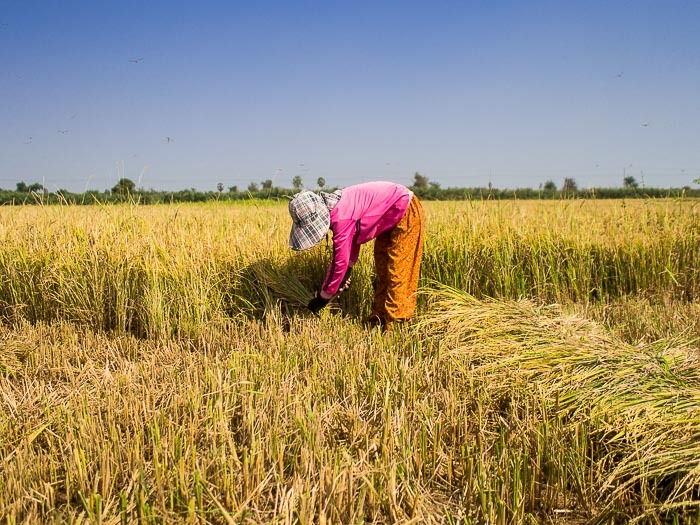 But in Cambodia, recovering from devastation wrought by American bombs, the Khmer Rouge and a Vietnamese invasion (that ultimately liberated Cambodia from the horrors of the Khmer Rouge), agriculture is still a manual enterprise. 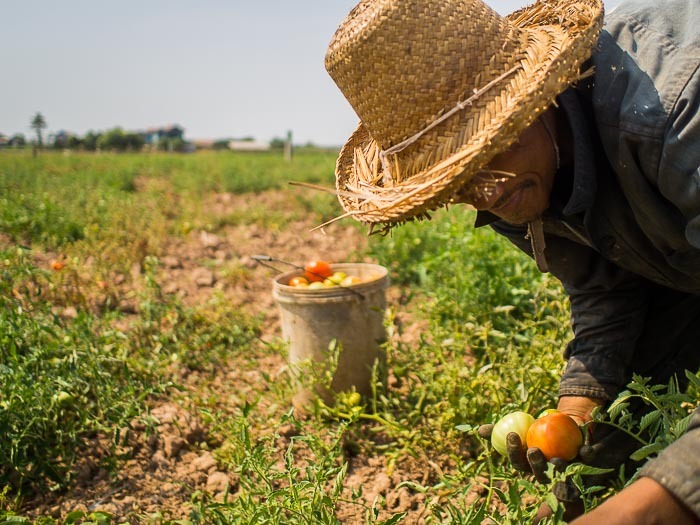 Heavy equipment is finding its way into Cambodia's agricultural industries, but workers stooped over under a grueling sun picking tomatoes or cutting rice is still the norm. Women in a rice paddy. 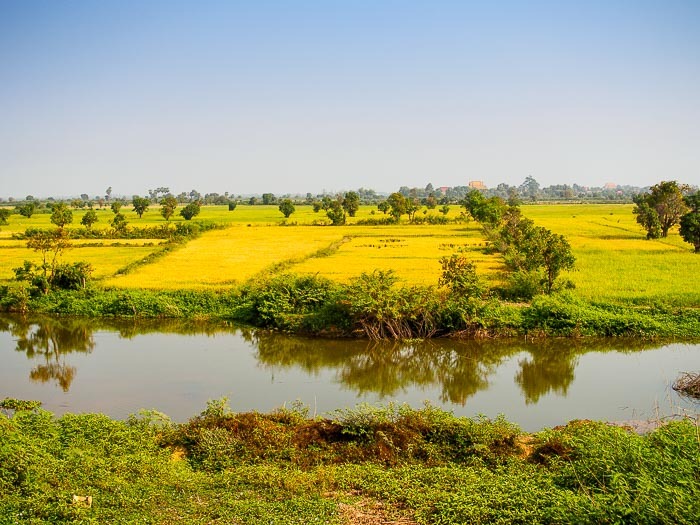 Rice paddies north of Phnom Penh. I can't imagine a more difficult job than cutting rice by hand in the heat of the Cambodian day. This is the beginning of the Southeast Asian summer and daytime highs soar up to around 35°C (95F) and it's very humid - this is not a "dry heat." It's brutal. Cambodia and Thailand share a religion and many cultural traits. The Royal Palace in Phnom Penh was modeled after the Grand Palace in Bangkok and Thai classical dance has its roots in the Aspara dancers of the Angkor Empire. Cambodia was essentially a vassal state of the Bangkok Kings until the French colonized Cambodia. The people of both countries are intensely devout Theravada Buddhists. 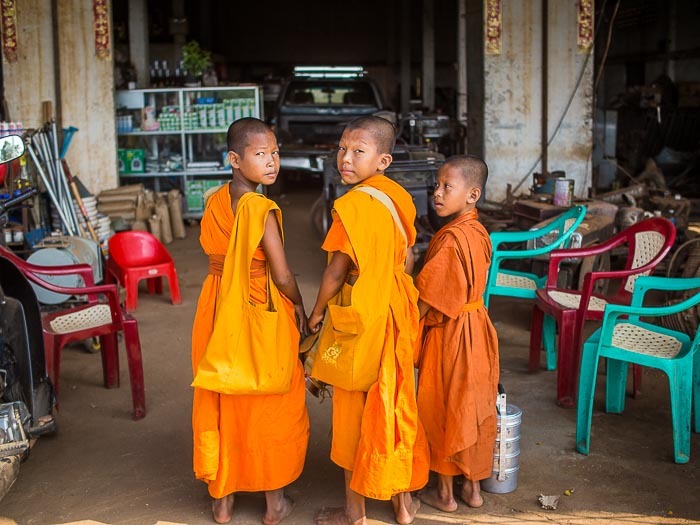 Novices - boys who spend their school break living in a Buddhist monastery - on their morning alms rounds. Such scenes are common in Cambodia, Laos and Thailand. 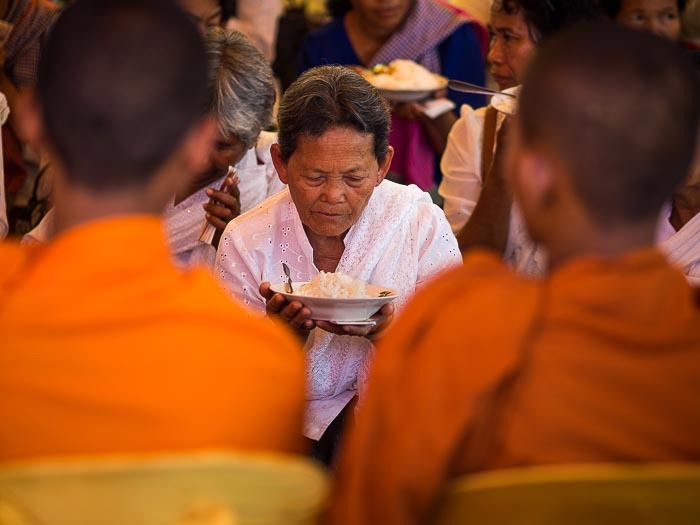 A woman presents Buddhist monks with food during a merit making ceremony at a home in Kandal province. Largely as a result of the American bombing of Cambodia in the 1960s and 70s and resulting Khmer Rouge take over of Cambodia, Thailand is decades ahead of Cambodia economically. 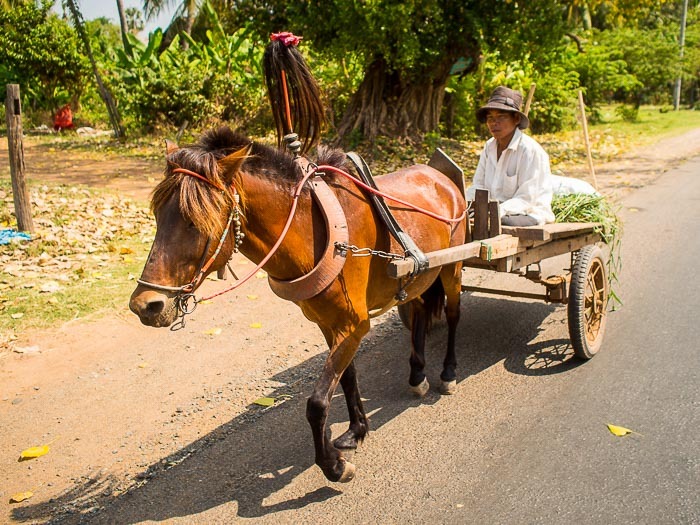 Horse and ox drawn carts are still common in rural Cambodia. Tuk-tuks, the ubiquitous three wheeled taxis seen everywhere in Thailand, Cambodia and Laos, are used as "buses" in rural Cambodia. 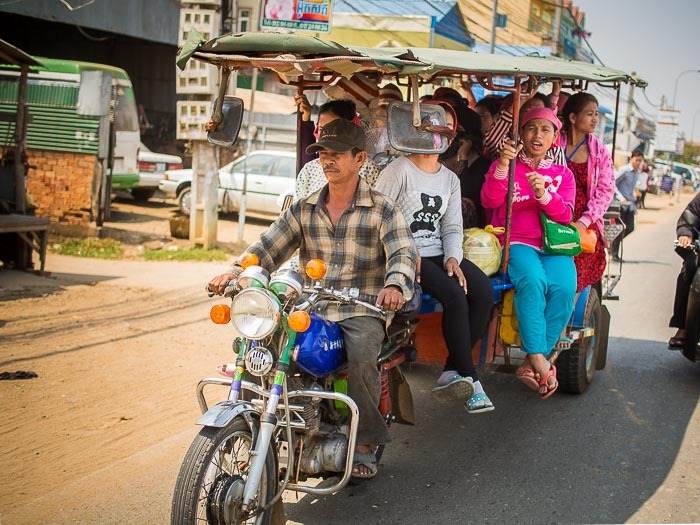 Instead of holding four or five passengers, the Cambodian tuk-tuk buses are four or five meters long with bench seats and sold up to 30 people. They putt-putt along the side of the road kicking up a cloud of two stroke exhaust and dust in their wake. A horse drawn cart in Kandal. A tuk-tuk bus coming into a town north of Phnom Penh. There are more photos of rural Cambodia in my archive or available from ZUMA Press.